While Delhi has always been at the forefront in solar policy making with solar net-metering having been notified as far back as September 2014, on June 6th, 2016, the current government of Delhi lead by Mr Arvind Kejriwal has further buttressed the Delhi Solar Policy and has sold everyone the dream of a rooftop decorated with a solar system that would allow them to harness the immense power of sun to generate electricity. The announcement of the solar policy of Delhi 2016 aims to make Delhi a ‘Solar City’ with a target that by the year 2025, the state would be able to produce about 2GW of solar energy. This equates to solar contributing to more than 6.5% of electricity produced within the state. As of September 2016, Delhi claimed to have 35 MW of rooftop capacity installed, and if the target of another 1945 MW is to be achieved in the next 9 years or so, a large percentage of the 30 lakh residential and 12 lakh commercial, industrial and other consumers that are in Delhi must come together for the cause of going solar. Net metering is available for systems above 1kWp but less than 1MWp, subject to conditions such as your sanctioned load, the capacity of your local distribution transformer. The electricity generated into the grid will be paid at rates as determined by DERC. A Generation Based Incentive (GBI) of Rs 2 per unit is also being offered for three years, which may be further increased depending on the interest and popularity of the project and scheme. The funds for the same will come from the Green Fund that has been set to promote solar energy. This GBI will be available only for those who cross the threshold of producing 1100 solar energy units (kWh)/ annum/ kWp. The government has also announced group and virtual net metering offerings for residents in Delhi. Both the models of rooftop solar PV usage will be made available: self-owned net metering (CAPEX model) as well as the third party owned PV net metering (RESCO model). It is also mandatory for all existing and upcoming government buildings, aided hospitals or schools or educational institutes like colleges to host solar plants especially if they have a rooftop area of 500 m2 and more. The Delhi government has announced that the height of the structure installed to carry the solar system will not be counted as an extra towards the permitted height of the building unless the building is located near the airports. There will be absolutely no need to take permission from municipal corporations or development authorities such as DDA to put up solar panels. These are just some of the key highlight announcements that the government of Delhi has made in order to increase the push for rooftop solar in India. With >300 days of bright sunshine expected annually in the capital city of the country, and with government backing and making things simpler than ever to go solar, it is the perfect time for you to go solar. You may just be wondering as a resident of Delhi, how much of a difference you will see by going solar? The short answer is, a lot. 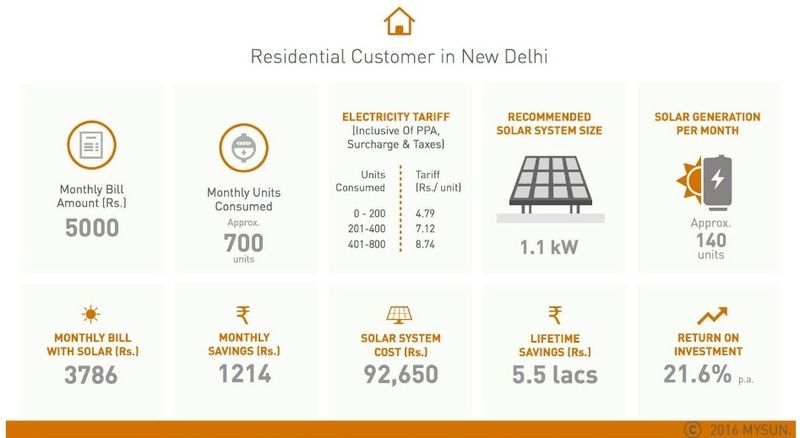 We have developed an infographic of a typical Delhi-based resident, by inputting his details in our Solar Calculator, on the impact he would have when he decides to go solar. As per this illustration above, purely from a return on investment(ROI) point of view, a typical residential energy customer in New Delhi (Image above) stands to make an ROI of ~21% annually for 25 years for a system that would cost just Rs 90,000 (1.1kWp), and this is even before the benefits of Net Metering or Generation Based Incentives are factored in. Of course, the size of the system and ROI will be different on a case to case basis. Compare this to an investment you would make in say stock markets or mutual funds and the gamble you take. Not only will going solar help you make huge lifetime savings, the contribution to the environment will be a gift for your children and several generations to come. Surely, this initiative from you will go a long way in ensuring that Delhi does not remain one of the most polluted cities in the world. So go on Delhi, Register your Rooftop now with MYSUN and take action, because going solar has and will never be simpler and MYSUN makes sure that your journey to solarization is as simple as counting 1-2-3. With a list of pre-screened partners on board, MYSUN connects those interested in going solar to the best and pre-rated solar suppliers. We are literally just a call or an E-Mail away from you throughout your journey and you can find the details on the contact page. Also, if you are interested in knowing the state wise solar rooftop policies of each individual states in India, you can find them all collated at one place, right here. Thanks. 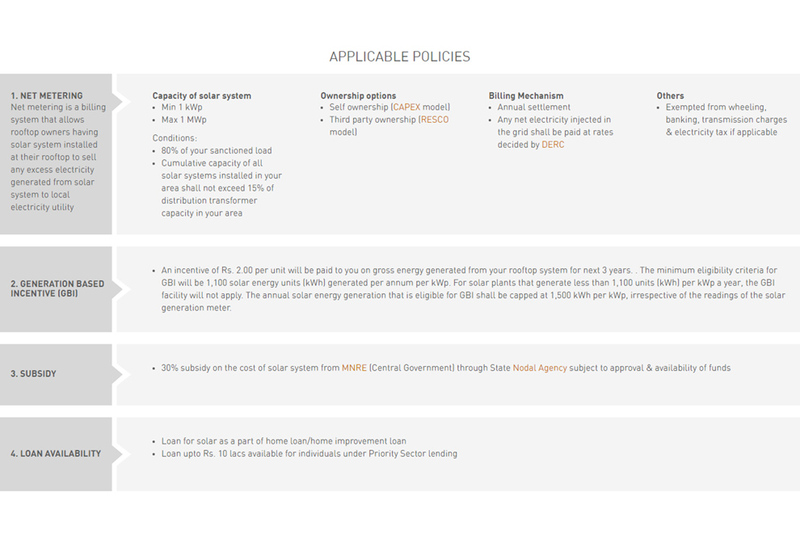 Can you please share the solar policies available in Noida for residential customers? Just a query : In the example above, monthly units consumed is 700 units, given the sanctioned load be 80% in Delhi, we can go for system size that can contribute 560 units. Considering solar radiation being 4 units per day, the system size comes out to be 1.4 KW – how have you calculated 1.1 KW, and 140 units from that? Thanks for writing in. Just to give you a brief insight, we use different algorithms to propose a suitable system design for consumers. Sanctioned load is not the only factor that we consider. We also consider users consumption pattern. The generation data shared in the article is for an actual user in Delhi. I have a roof of1000sqft. In those area how much kilowatt or units will produce per day. Generation depends upon a number of factors such as the type of roof, place of installation, the height of the structure, shading pattern on the roof etc. Precise information can be given only post a thorough site assessment. However, if you just are looking for an estimated number, for a 1000 sq ft shadow-free area, a system of about 9kW can be installed. if you are in Delhi/NCR region, and are looking to go solar, you can register your rooftop with us at: itsmysun.com/register-your-rooftop-for-solar for a site survey. Can you please shed light on effect of smog on solar panels? what is the drop in output in winters duw to smog? Will the PM2.5 and PM10 particles hamper panels efficiency permanently? Also, how immune are solar panels to hailstorm? “Smog will reduce the output of solar panel as the diffuse component of solar light will increase as compared to direct sunlight. The magnitude of reduction is dependent on the intensity of smog. PM2.5 and PM10 particles do not hamper panel efficiency permanently. Please feel free to speak to our experts for further queries by visiting our Contact Us section. Thank you for your interest in going solar, our team is in touch with you over e-mail.